9ct Gold bracelet with over five carats of Green Agate gemstones. 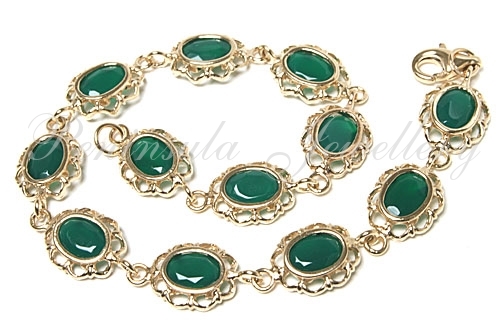 This bracelet is fully hallmarked and features twelve 7x5 oval cut Green Agate gemstones. Sturdy lobster claw clasp. Dimensions: 19.5cm long, 9mm wide. Weight: 7.2g. Made in England. Presented in a luxury gift box – Great Gift! !